Good news! I’m out of the well! Okay, technically I haven’t been trapped in a well. But astute observers may notice it has officially been one calendar year since my last post here. At that time, I was hoping to have the 6th book of the Norothian Cycle ready for release in 2014. That’s when I fell in the well. Metaphorically, I mean. The course of human events, life-the-universe-and-everything, so-forth-and-so-on, and here it is one year later and I definitely did not get a book out last year. Really, I hardly did any writing at all, which seems hard for me to imagine now, but there you go. How does an author accomplish nothing in a year? One day at a time, man. One day at a time. I am happy to say that I am back at work on B the 6 now, and as I did have quite a bit done before my sojourn in the literary Sahara, the ultimate release should not be all that far off, relatively speaking. I’m not ready to commit to any date, for fear of hamstringing myself if I try to hit a deadline. 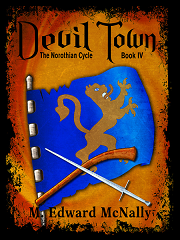 But Book Six of the Norothian Cycle, still (I think) titled John the Red, is forthcoming. I promise. Love the books; glad to see you back in action! Sometimes life just gets that way, and other things have to come first. Hi, I just finished reading your Norothian Cycle Books…TOTALLY AWESOME! Thank you so much for sharing your awesome talent with us! I can’t wait until book 6 comes out. I understand about the time thing, my daughter writes as well so, just take all the time you need to get your masterpiece done! Hi Ed, any updates forthcoming? Oy. Life pretty much intruded on the writing. Want to get back to it, but don’t know when at the moment. Thanks for asking, though. Absolutely love this series easily one of my favorites. Great characters, with John being at the forefront. Please don’t stop writing you have much potential. I for one will be a faithful reader for as long as you write. Thanks!! Hi! Just wanted to let you know I’m a fan of your writing and that I hope you can continue in the future. I read the first 4 books in 2013 (holding off on 5) and continue to come check periodically to see if there are any updates. I’ll always keep an eye out. Wishing you well. Hi, just wanted to add the voice of another fan waiting impatiently to purchase your future works. I came looking for you; alas, you are gone. I’m not going to give up on you. You shouldn’t either. I know there’s a Book 6 in there and I hope someday it will be published. In the meantime, enjoy your life and what you’re doing now. One more person who wants to say that he is eagerly awaiting Book 6! P.S. – Heh, I just realized how often I referenced feces in one form or another in my comment, please excuse my adolescent sense of humor. I write in the hope that you have not undergone some trauma, and that the conspicuous absence of John the Red for the past several years is due to an extended vacation somewhere pleasant. I have purchased all of your books, and look forward to purchasing more. I am sure I am not alone when I say sincerely that I hope to hear from you soon. Hi – can anyone give us an update on you and your well being? I have read and enjoyed your books and hope to read more in the future.